Our classic Olde Ale redefines the term "bull-bodied" with its deliverance of complex and firm malt flavor. A fine blend of British and American hops provides an even bitterness as this beer finishes with a warming alcohol flavor. My son John and I returned a few empty beer bottles to our local Delaware beer store. We ended up returning 7 cases of bottles. That was $8.40, so we bought a 6pack of Lancaster Winter Warmer as a reward. I had two that night and was extremely impressed. Now I’m going to give this sleeper a full review. The beer pours a clear very dark brown with deep ruby hues and a modest off white to tan head. The head diminished fairly quickly to just a ring around top of the glass. The nose is nice with rich dark malt aromas, interesting hop aromas and a sweetness that might be from alcohol. This is all with a very unique earthiness to these aromas. Wow, this may be the Sleeper Ale of the Holiday season. I’m going to have a hard time describing this complex and warming Winter Warmer. 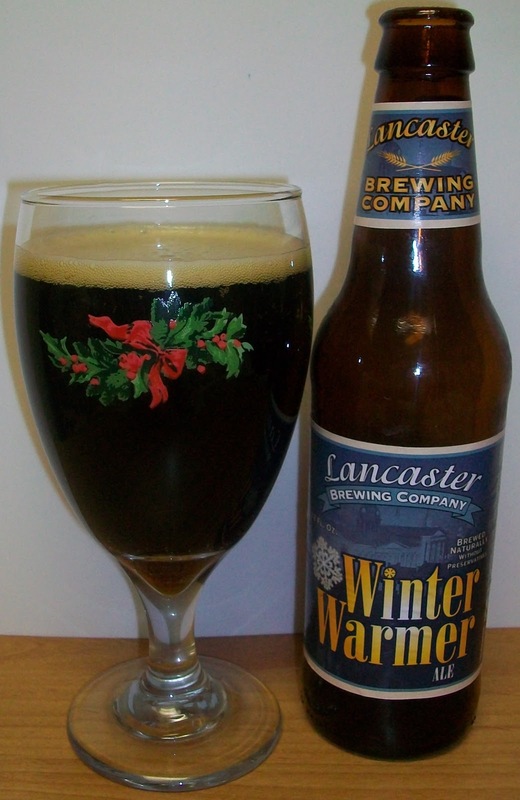 First of all it is great to taste a beer called a Winter Warmer that is actually warming. So let me attempt to explain this ale. This experience starts off with sweet dark malts up front then a building malt bitter, no more like a malt earthiness over the tongue in the middle of the sip. By the time you get to the top of the swallow this diminishes back to just a rich dark roasted malt flavor. The back end is fairly easy drinking but you can start to pick up the alcohol and bitterness during the swallow. The finish is fantastic with robust malt flavors, unique hop bitterness and the sweet taste of alcohol. The final aftertaste is that earthy malt flavor, Well, I’m assuming it’s from the malts. This is the same unique flavor that is found in German Alt beers. There is also the most pleasant warming effect from this brew. I can’t tell you how impressed I am with this beer. And to think that I just picked it up on a whim not knowing anything about it. What a great find. I’m a little more than half way through this glass but I’m going to let this set a few minutes and warm up a little. I’m curious to see how well it warms. We are not at 65 degrees. Ahhh, this is an excellent warmer, in more ways than one. This beer has really opened up. The malt flavors are not only richer they are smoother as well. The nose seems a little different now also. I am picking up nutty aromas from the malts that I did not notice earlier. We are sitting at room temperature now. This beer has been fantastic; excellent, even to the last warm drop. Man, I can’t tell you how impressed I am with this beer. And also what a surprise, I didn’t expect to get my socks blown off like this. This is a Solid A and the Sleeper Beer of the Season! I was very impressed with this unique Olde Ale. The unique rich malt and hop flavors along with sweet alcohol and the most pleasant warming effect make this Alt the perfect Winter Warmer. Hat’s off to Bill Moore and the crew at Lancaster Brewing on this excellent Winter Warmer. I highly recommend this beer to anyone that is looking for a good Winter Warmer and at 8.9% ABV this Winter Warmer really is a Warmer.